Sometimes it is just being in the right spot at the right time. On my way home from work yesterday, I chased an intense rainbow into Pelican Rapids, Minnesota. 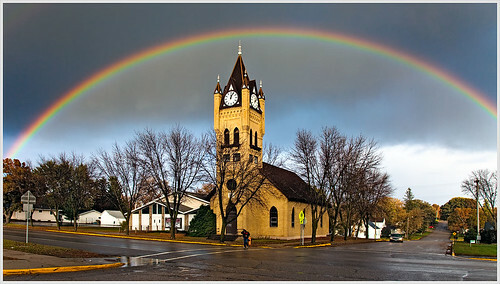 It was then kind enough to perfectly frame Faith Lutheran Church on the town's main street. This is close to being straight out of the camera with just a little perspective correction and cropping. The clock must be broken because this photograph was taken at about 5:30 PM yesterday.